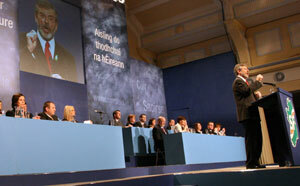 The 2010 Sinn Féin Ard Fheis will be broadcast live on TV on Saturday 6 March. Sinn Féin representatives and activists from across Ireland will address a range of issues, from the Hillsborough Agreement to the economic crisis, between 11am and 1pm on RTE 1 and BBC. The Presidential Address by Gerry Adams will be broadcast live at the new time of 8.30pm on Saturday evening on RTE 1.